Orthodox Church liturgical Greek Priest clergy vestments (blue-gold) by Istok Church Supplies Corp. Celebrate feasts and days honoring the Most Holy Theotokos by wearing one of our superb Greek Priest vestments in blue and gold. 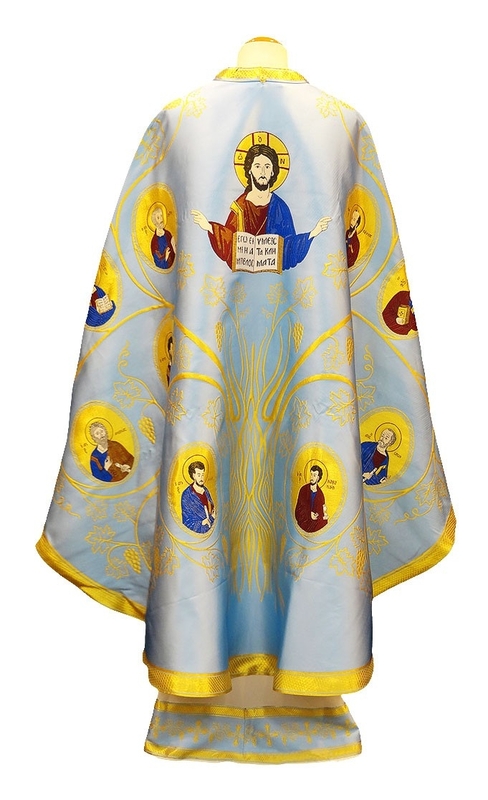 Istok Church Supplies offers these official vestments in a wide variety of designs and no matter which model you select, you are sure to add grace to your service and Church interiors. Each of our Greek Priest vestment set includes five items – phelonion, zone, epigonation, epimanika and epitralhilon. Sets do not include the podriznik which customers can order separately from the corresponding section on our store. Customers can add matching chalice covers and veils to their sets by selecting from the given list of options. Our Greek Priest vestment sets are designed by experienced and knowledgeable designers who understand the nuances and canons of these liturgical garments. Each order is individually tailored to your set of custom measurements. 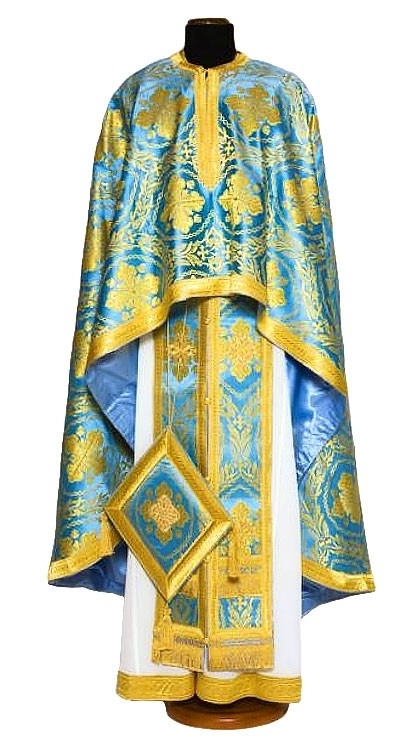 We offer two fabric options for our Greek Priest vestments blue and gold - rayon jacquard brocade and metallic jacquard brocade. Vestments made of rayon jacquard brocade are of excellent quality and cost-effective whereas the ones made of metallic jacquard brocade have a beautiful shimmer to them and are guaranteed to last a long time - both types are fine choices for official liturgical services. Fabrics feature intricate patterns and designs, ranging from simple to ornate, and customers can decide according to their style preferences and budget. 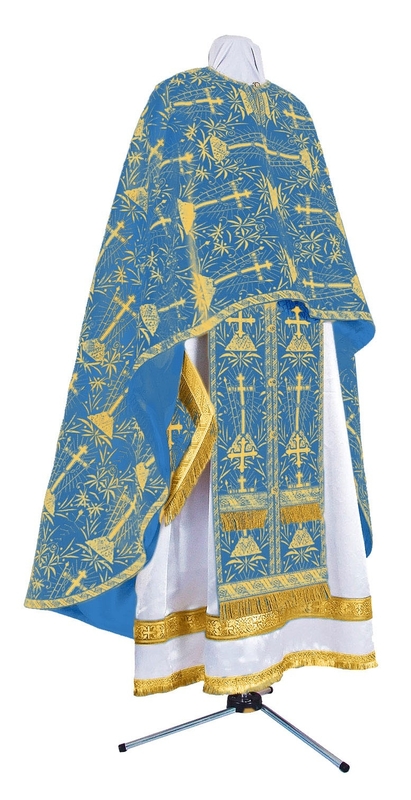 Blue and gold Greek Priest vestments are available with three trimming options – standard, premium and luxury. Trimmings are appliqued onto the garments. For standard trimmings, we provide inexpensive galloon and simple machine made crosses. For premium decoration, we offer good quality galloon and intricate machine made crosses. For luxury style, we include solid jacquard galloon and beautiful hand embroidered crosses. For added comfort, we provide natural velvet inserts and customers can enhance the beauty of these vestments by choosing from the given list of embroidered icons. Quality and authenticity are our guarantee – so shop confidently knowing you will receive highest quality Greek Priest vestments at affordable rates.